What is the cost of congestion? What level of impact does congestion have on the functioning of Auckland? To what extent would Auckland’s economic performance be improved by the reduction or elimination of congestion? What does “uncongested” actually mean? If traffic congestion ‘costs’ us a particular amount each year, what is the comparison with – empty roads? 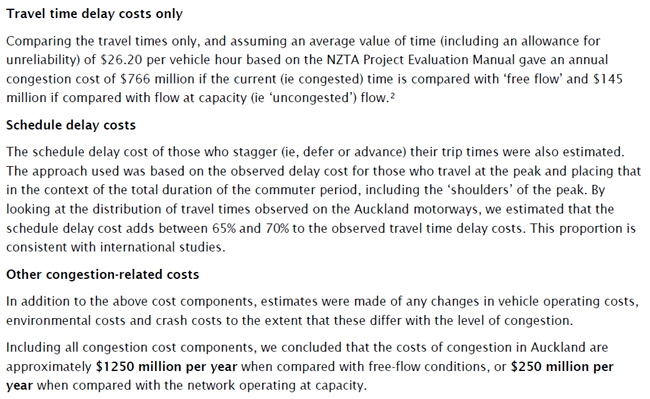 A research paper prepared for NZTA helpfully attempts to answer a lot of these questions and to structure a much better informed debate over the true cost of congestion – particularly in Auckland. A lot of this debate, as the paper notes, comes down to definitions – what is congestion? The purpose of this research was to develop improved approaches to assessing the costs of urban traffic congestion and to make corresponding estimates of the costs of congestion in Auckland (New Zealand). Various definitions of congestion were reviewed and it was found that the concept of congestion is surprisingly ill-defined. A definition commonly used by economists treats all interactions between vehicles as congestion, while a common engineering definition is based on levels of service and recognises congestion only when the road is operating near or in excess of capacity. A definition of congestion based on the road capacity (ie the maximum sustainable flow) was adopted. The costs of congestion on this basis are derived from the difference between the observed travel times and estimated travel times when the road is operating at capacity. It is interesting to look at this ‘definitions’ issue in more detail to gain an understanding of what congestion actually is. I find the debate between the economist’s definition and the engineer’s definition – as noted above – pretty fascinating because the economist’s definition potentially leads to the construction of more roadspace (as the threshold for congestion is lower) whereas most transport economists would probably feel more nervous about building additional road capacity than traffic engineers would. I actually agree with the engineering definition because building a transport system to ensure that no vehicles impact on others is just plain stupid and impossible, while the real impact of congestion beyond a certain level is a reduction in the efficiency of the system – that is once you pass an optimal level the number of people/vehicles that can pass across a certain point begins to reduce. As the research paper notes, at zero speed there is zero flow. This is shown in the graph below: It’s only the bottom half of the graph above (speeds lower than about 42 kph) which actually indicates congestion in my opinion – where the efficiency of the network is reduced because it has become completely overloaded. The research paper takes the same viewpoint. Applied to Auckland, we actually find that the current speeds on parts of the network analysed are pretty damn close to the most efficient (i.e. maximum flow) speeds – as shown below: Using this information, the pieces of the puzzle about how much congestion really costs Auckland can start to be put together: I’m not entirely sure how relevant the “schedule delay cost” is to working out the economic impact of congestion on Auckland, because it seems like these trips were still taken in an efficient way just not necessarily at the most desirable time. But in any case, using a reasonable definition of congestion highlights that while $250 million a year is quite a bit of money, it’s perhaps a bit less than is often spouted (that $1 billion a year figure which apparently comes from a 1992 survey that unsurprisingly looked at comparison to free-flow (i.e. empty motorways) traffic. What would be really helpful is to get an idea of where this $250 million of congestion impact happens and who it happens to. If it’s largely impacting on people in far flung suburbs who would just sleep in if their commute was a bit shorter, then I don’t think Auckland’s likely to benefit too much from eliminating/reducing it. However, if the impact is on commercial vehicles (trades vans, couriers, time-sensitive deliveries etc.) then there might be a benefit from reducing congestion. So overall, I think what I take away from this research is a couple of things: firstly, that congestion is probably not as bad as we had thought if we use a more sensible definition. And secondly, that perhaps we still don’t really know much about the linkage between congestion and Auckland’s actual economic performance. While nobody likes being stuck in traffic jams, for some reason we seem happy to throw billions of dollars a year at trying to fix this problem without even working out whether it’s a problem in the first place, how bad a problem it is or even whether what we’re doing is making things better or worse. To me that seems pretty reckless and dumb. Or to keep things a little simpler: what you feed grows. If all we do is invest in infrastructure for the private car then we will have a lot more driving. And all the benefits and dis benefits thereof; congestion is but one of the dis-benefits. It is the most expensive and least efficient movement system, it is especially wasteful of land value, it is dangerously and expensively dependent on imported oil and machines, it keeps us less fit, more angry, and poorer. It kills and maims more of us per annum that other systems. Anyway because congestion is a direct result of a building a (growing!) city only served by driving our masters have chosen it as our destiny. Or as they put it: We all want to drive so therefore we have all chosen congestion. It is impossible to ‘solve’ congestion by encouraging driving; ie building more roads. Remember no driver is stuck in a traffic jam: They are the traffic jam. You want less congestion, don’t drive. If we want other people not to drive then we had better build some really high quality alternatives. The evidence from ancient Rome is that congestion is the result of building growing cities, full stop. The modern city exacerbates the problem by having a standardised 9 to 5 workday. Even if everybody lived in the same building they work in the demand for peak elevator or stairway capacity would have huge transport costs in terms of non-rentable floor area. It is absolutely correct to say that “We all want to drive so therefore we have all chosen congestion.” It is only impossible to solve congestion by building more roads because there are too many snobs who think their property values are sacrosanct and use smartalecky lawyers to keep motorways out of their posh suburbs. Oh, and too many cheapskates car owners who don’t want to pay what it actually costs to build multi level motorways and parking buildings or to compensate landowners at fair market values.But the same can be said of PT and PT users. However the elephant in the room is the fact that public money spent on congestion reduction, irrespective of which transport mode is congested, is really a subsidy to the corporations that build the skyscrapers and mega factories that create the congestion in the first place. Your data about congested cities being the most productive is about as baseless as saying the cities with the most baseball caps are the most productive. It’s just ignoring so much information it’s not funny. Dan, I think you are confusing causation and correlation. The point is that successful cities are always going to have congestion, so we can’t “fix” congestion no matter what we do. All that’s possible is increasing capacity while staying at the same level of congestion. So what your saying is that that various congested cities in China, India and Thailand etc are some of the most productive per capita in the world? Interesting. “successful cities are always going to have congestion” is not the same thing as “congested cities are always going to be successful”. What do you mean the data is wrong? Data is data. Facts. The presentation or interpretation of that data might be off-target but the facts can’t just be waved out of existence because they seem incorrect to you. In this case it’s not that congestion causes productivity (as was implied in the article), it’s that productive cities tend to be congested and nobody in the world has found a way to solve it. Building more roads seems to help only for a few years and then congestion sets in again. There’s plenty of data that shows this. Since there is a great resistance to increase housing density (reduces commute distances) or heavily invest in PT (more efficient transport) that only leaves more roads as a ‘solution’ to the problem. The roading lobby loves it (+money), most of the population loves it (+votes) and the benefits last only a few years so in the next election cycle you get to be popular again and BUILD MOAR ROADS. But from whom? Seems a relevant thing to address. Data can be wrong. It can be collected wrong and it can be collated wrong, well before it is analyses wrong or interpreted wrong. Data are observations of the facts, an attempt to record the real world. If you think data is data and just facts you’ve obviously never worked in research and don’t understand the scientific method. Yes Nick you’re right but any claim here that data is ‘wrong’ or misinterpreted needs to be backed up with evidence or it’s just groundless opinion. And therefore; meh. For some reason I thought the optimal network speed on the motorway was around 70 km/hr, rather than the 50 km/hr suggested here? Also this research doesn’t tie in with the survey done last year (also by Ian Wallis Associates), which found that less than 10% of commuters would use travel time savings for more work. Furthermore 40% of commuters actually liked their commute. 20% of commuters would not take a Star Trek teleport option if it was available. For these reasons I’m sceptical about the quoted $26.20 per vehicle. Cam the $26 per vehicle comes from the NZTAs economic evaluation model, which is based on the difference between congested level and free flow. What this is suggesting is that a better measure is comparing congestion against a capacity measure. I thought the $26 per vehicle per hour was the value of the travel time saving, based on the commuter’s salary, among other things. It is the same no matter what modelling is being done. Public transport user’s time is valued at about $21 per hour. Sorry, am I missing something, does it define free-flow as empty somewhere? Or is free flow the point where everyone can do 100 km/hr? Cause the two are very different…. What irks me about the self-defeating (and socially bankrupting) quest to eliminate congestion is the complete failure to factor in the importance or value of the individual vehicle-journeys contributing to that congestion. Traffic volumes are taken as given, and huge sums are made available to accommodate them. No doubt a proportion of this traffic will be “high value”, but a proportion will also be optional/discretional/frivolous and existing benefit-cost techniques appear not to discriminate. Just how much is it worth spending to ease congestion caused in-part by people say, driving to the shops for a packet of cigarettes? Or dropping off kids at school who could easily walk? Or meeting someone at the airport who could otherwise use public transport? Clearly if effective road-pricing at point-of-use was in place, the individuals considering such journeys at busy-times would need to weigh-up whether it was worth the $26/hr or whatever that it might cost them. And yet $billions in transport funding are indiscriminately shelled out without regard to this. All vehicle journeys are lumped in together as being of the same value. But how was this value assessed? Who was surveyed? What questions were asked? What alternative choices were offered. . . .? And then the same cretins who fail to factor-in the low-value assignable to some (possibly many) car journeys, are quick to proclaim that public transport journeys have a lower-value than car-journeys! Does anyone know whether this whole issue has ever been objectively and impartially validated, or does everything hang on the subjective assessments of a few transport economists who somehow “know” just what is worth what to whom? Very few people realise that ~45km/h is the optimum point for traffic flow. Faster than this benefits individuals, but because the distances between vehicles increase dramatically (naturally, as people need safety) the number of vehicles passing a point decreases. Once you get people up to 80 or 100, they need great space, and if they have less than that the whole thing collapses back towards an equilibrium which is less than 40 (because the 100km/h vehicles represent an inflow faster than the system can sustain). I’m particularly critical of our roading system’s inability to restrict speed where necessary. Variable speed limits on motorways would increase flow, reduce congestion, reduce crashes (surely injury and fatal crashes are a major indicator by which those responsible judge their performance) and the carnage and congestion that follows them, reduce transport emissions, and provide for a generally more pleasant driving environment – I assume that for most people steady flow feels better than sitting in place interrupted by brief bursts of speed followed by frustrating sitting in place. In order to enact this, we only need put variable speed limits in place, and implement large electronic speed-limit signs. For the cost of a few million, you get a great deal more. ^ HTML fail. I only meant to highlight “engineers”, and those tasked with turning policy into transport. One of the good things about congestion is that it makes you think about your journey, like do you even need to make it are you doing it the best way or even traveling to the best place along the best route. Very true. It also tells us that we need to provide alternatives to deal with those peaks and that is where PT is at its best. I think it helps to think of PT with its own ROW as like a motorway that deals with peaks in traffic. That peak may be both time based (e.g. 7-9am weekdays) or destination based (lots of people travelling between two points). The heavy train lines we have can supply capacity the same as a 10 lane motorway. It has a lot of comparisons to a motorway. You cant get on/off wherever you like. You must wait for an exit/station before you can get off. It also cant easily change its route. Also, once you are off either the motorway/rail line, you then have to deal with no ROW and the problems that go with that. That is why in Auckland, most people really complain (except in exceptional circumstances like last Thursday) about the congestion on the roads getting on to the motorway. The only real disadvantage with a rail line is that once you get to your destination, you may not have a form of transport waiting for you to go on to the next destination. Of course, Park n Ride and bicycles can serve that purpose. I think ebikes would work so well with PT and mean the vast majority of people in Auckland can easily commute 2kms to the nearest PT ROW. Cars are more closely spaced at 45 km/h, as George D suggested. the variation in the capacity depends on what type of road link you are talking about. Us economists may define congestion as being all reductions in vehicle speed, however slight. But I hope we would also point out that there is an “optimal” or “efficient” level of congestion, which is certainly not zero. It’s probably pretty close to the middle of the U, i.e. the 1,300 vehicles per hour which means that the road is transporting as many cars as it possibly can, thus making the most efficient use of the resource. And we certainly (I hope) wouldn’t want to build a $400 million road which only gets rid of $100 million of congestion in its lifetime. Economists are more concerned with the “deadweight loss” of the congestion, or the deviation from the optimal level. So we’re probably not that different from the engineers after all. Unfortunately what the political class means by congestion is any kind of perceived delay when driving- especially when and where they are driving. Hence their uneconomic commitment to sweeping grade separate motorways, that do not, as you say, lead to efficient utilisation but rather an expensive over supply of roadspace. 2. discussing what if anything should be done about it. The facts of the situation are as shown on the speed-flow graph. At what point you wish to pin the label ‘congested’, rationally, has nothing to do with the question of whether the situation is satisfactory or unsatisfactory or what should be done about it. – pin the label ‘congested’ there. This regrettably confuses points 1 & 2 above. It allows people to say ‘because “congestion” is a Bad Thing, and such and such situation is ‘congested’ [by my definition], this means that the situation is unsatisfactory’. The circular reasoning allows them to avoid justifying properly what they think should be done about it (which is often, ‘build more roads regardless of expense’). Surely for a budget constrained public authority the most relevant concept is ‘the economically optimal level of congestion’ – that is, the level where further mitigation would have more costs than benefits. This point is not necessarily at the right most point of the curve – it could be anywhere depending on the value of travel time and the cost of mitigation. Why do people who accept standing in a queue at the supermarket checkout get so bugged by traffic congestion? Rationally, they are similar situations. – you’re at the supermarket voluntarily for the sake of greater choice, lower prices etc. You know that if the queues become too long you can come another time, or take your business to the less crowded specialty shop. – by contrast, in the journey to work in a car dependent city, you’re pretty well trapped in the queue. 2. As well, the queue at the checkout (like many other queues) is generally more predictable and less stressful– you have a fair idea of how long you will wait, and you can veg out while you do. No so for waiting in the merge lane on the motorway. 3. In the private enterprise supermarket, possibly people are more likely to understand the connection longer queue > more efficient cost structure > lower prices. In the case of a public good like the road system, provided by government, those links are not so clear. It’s easier to complain that ‘they’ should do more about it. Thank you Peter, a very good and fascinating posting. 1. Can you check whether the chart used showing speed vs. flow is in kph or mph? I am familiar with the chart since I am a practicing traffic engineering in the US. The chart shown is generally in mph. If revised to kph the speeds shown might change by a factor of 1.6. 2. Total agreement, congestion is poorly understood. The fact is that congestion is equivalent to economic vitality, the more congestion the better economic success of the region. To solve congestion it might take a 10% downturn of the local economy or pay 10% of the workforce to stay at home (how about for that congestion solution?). 4. Your statement about “the economist’s definition and the engineer’s definition” of the speed vs. flow chart is in fact very fascinating and warrants more investigation. 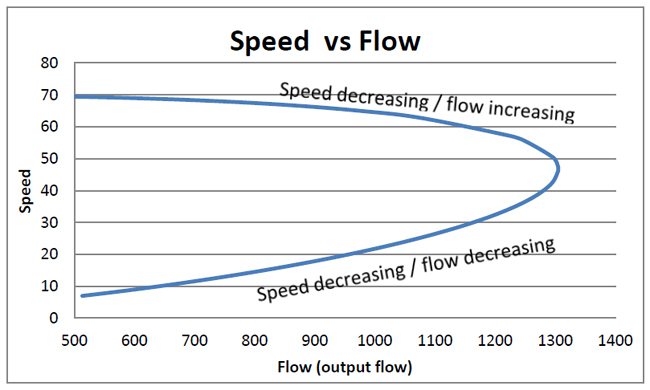 However, looks like the speed vs. flow chart is not fully understood. Like Tom commented “What do you mean the data is wrong? Data is data. Facts.” If not mistaken, the chart is based on empirical data. It indicates that as speed varies so does vehicular density with highest density occurring at about 45 mph (not kph – however, considering that speed and density is relative to driver culture/behavior it might be that in NZ it is 45 kph.). Which leads to your statement that “congestion” is not well defined. Lastly, in the US traffic congestion is defined as level of service or LOS. As you likely know LOS ranges from A through F. In terms of traffic impact analysis we design roadways to have a LOS C or D during peak hours.